'Blue Wind' (David Spence, R. 1981). Seedling S78-1. MDB, height 7.75" (20 cm). Early bloom. Ruffled light blue, diamond-dusted self; snow white beards. 'Wee Turque' X 'Little Miss Muffet'. Four Square 1982. Honorable Mention 1987. From AIS Bulletin #241 April 1981 Introducing BLUE WIND (D. R. Spence 1982). Sdlg. S-78-1: (Wee Turque X Little Miss Muffet) MOB, 7.75" (20 cm), E. The "state of the art" in miniature dwarfs. Ruffled light blue, diamond dusted self; fat snow white beards. Horizontally flaring falls, 1 branch with 2 buds; pleasingly scented. Best seedling 1980 ISM early show. EC 80 and 81 in St. Louis, where Blue Wind was very well liked. $12.50 postpaid with extras. 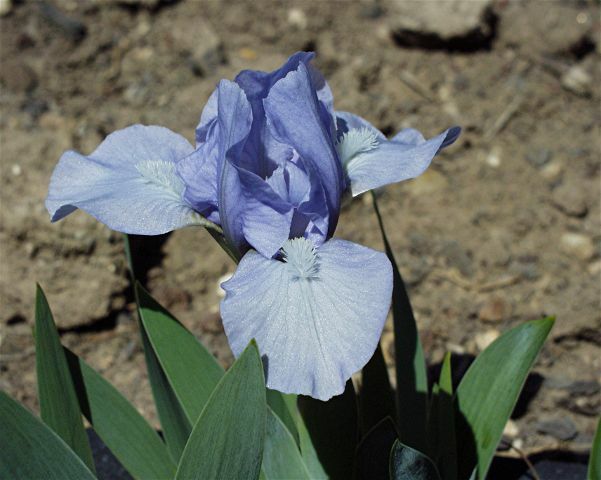 4 - Square Iris Gardens.